If we told you that the Flyers were playing just around .500 hockey, showed flashes of being contenders but also flashes of frustratingly sloppy play, had no clear No. 1 goalie and had a promising and exciting set of top prospects — you'd say: "yeah, that was 2015." "Or 2016." "Or 2017." "Or wait, maybe that was 2013." It sounds like a broken record, but through the first few weeks of the season the Flyers are two points out of the playoff picture (granted, very early) and are looking just like, well, the same old Flyers. The Flyers' top pick in the last NHL draft is playing okay, not great as a freshman at BU. Through seven games he has two goals, five points and a minus-2 in the plus/minus column. Most expect the 18-year-old to find his legs and become a dominant two-way college forward. 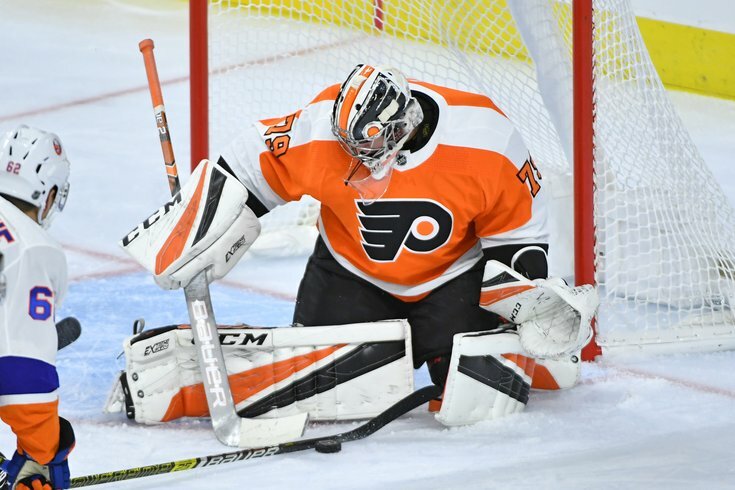 The goaltender many hope is the Flyers' savior in net in the near future is adjusting to the professional game. In seven starts he has allowed 23 goals, a 3.50 goals against average. His save percentage is a meager .883, while he has mustered three wins to two losses. He is yet to allow fewer than two goals in a game for the Phantoms. The big 6-foot-5 defenseman has been flashing his offensive skills of late, boasting six points over his last six games. He has nine overall through 13 games as he settles in for his second pro season. Frost continues to show he has a knack for scoring and was deserving of a first round selection back in 2017, as he is on fire in the Ontario League. Through 21 games he has 36 points, including 23 goals. Frost was impressive during limited preseason action with the Flyers and could be a real NHL possibility after hie finishes his final year of eligibility in Juniors. The Russian first round pick had a goal and assist in the Phantom's blowout win over Springfield last week and has 10 points through 12 games, including two game-winners. One can't help but surmise his solid play brings him closer and closer to an eventual NHL call. The 19-year-old freshman, the Flyers second first round draft pick of 2018, has yet to net a goal or assist this season through five games with the Friars. The 25-year-old center is entering the do-or-die phase of his career as he attempts to crack the Flyers' roster for good. In 13 games in Allentown, the winger has four goals and four assists. He made a brief stint in Philly last season for two games and is surely anxious to return. Ratcliffe is 19 and in his final year in juniors and is slicing through defenses. At 6-foot-6, the huge winger has scored 14 goals and 10 assists through 19 games in the OHL. He was last year's second round pick. The junior forward made his anticipated return from ACL surgery and scored a goal. He was Philly's second round choice three draft's ago, and had an impressive 30 point performance in 22 games last season for the Broncos.